If you are serious about your chess, you will most likely use a chess clock during your games. Tournament players seldom play without one and pretty much all of the worlds chess federations stipulate the use of a clock during official competitions. Broadly speaking there are two types of chess clock, digital and analogue. The Analogue clocks have been around for years and use either a wind up watch spring mechanism, or a battery powered quartz system. 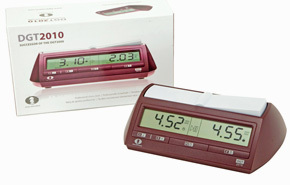 In more recent years we have seen the popularity of digital clocks grow. The digital clocks are more accurate, precise and can do a whole lot more than simply click and record time. The Regency Chess Company stocks a wide variety of chess clocks from the most recognised brands such as Garde, BHB and DGT. We stock the very basic plastic chess clocks, right the way through to top of the range digital clocks that display a variety of excellent features. 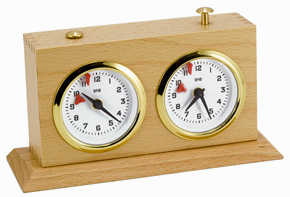 Where ever you are in the world, we can ship your chess clock to you quickly and economically. We hold stock of a large range of chess clocks in stock in our European warehouse ready for immediate shipping.